The Reflect Krystal Grand Cancun offers an idyllic beachfront location along the tip of Punta Cancun. This all-inclusive resort is perfect for adults and families alike with a full service spa, a large main pool, and a kid's club. 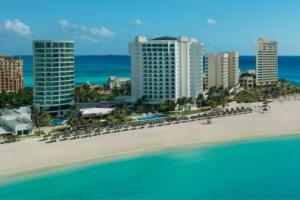 295 spacious rooms feature private balconies with views of the Caribbean Sea, city, or lagoon. Rooms also include flat-screen TVs, MP3 docking stations, wireless Internet, and marble baths. Enjoy varied dining options at four restaurants and live entertainment. The resort is walking distance to the main shopping centers and beaches of Cancun, and Cancun International Airport is about 30 minutes away.